The shooter was directly in front of me halfway between me and blueline facing me in shooter stance. Facing him was a defender. Back to my defender was another winger right on the edge of the crease waiting a left-handed point blank rebound. The defender gets a piece of it. The pucks slows and knuckles through the air and is going to land perfectly on lefty’s stick. Lefty is looking me in the eye. I do a quick head jerk to my left and hurl my glove in that direction too. Lefty bites for my bluff and the puck is harmlessly scooped off his stick by the defender. He never knew he was had. Hair on the back of the neck. This entry was posted in Uncategorized and tagged advice, assault, attack, father, fatherly advice, Istanbul, like father like daughter, moving forward, quote, story, tactics, Turkey, wisdom, words of wisdom. I’m nineteen years old, this concept of age is in terms of maturity but this number is true. I write, this much is true too. It has been only a short while since I have been admitted as an objective spectator to the events unravelling in Turkey. Almost everything else in this scene is ambiguous and invented. Invented, yes, but not playfully. This is most certainly not a game, especially to me. It’s a form: as I invent myself, even now as I write, I’m thinking of all I want to tell in regards to why this blog is written as it is- carefully constructed and selective. Par example, I want to tell you this: a few days ago, I watched a dog die after being struck by a tear gas canister on Kadıköy Haydarpaşa Rıhtım Caddesi on my way home. I did not kill him, but I did not do anything either. I was present, and my presence stained me with guilt just the same. I remember his face- this withered creature, hardened by the streets, stared at me with one icy, lifeless eye. His face, not as friendly nor pleasant as that of a pet, burned into my memory. Yes, I remember his face because his jaw was in his throat. I remember being overcome by the sickness of both disgust and heartache. I felt the burden of responsibility and was instantly overcome with undescribeable grief. I blamed myself. Justifiably so, I feel, because I was present. But, let me interrupt with more bluntness, perhaps even that story is fiction. No? I want you to feel what I felt. I want you to understand that sometimes ficticious truths are more real and true than those in reality. It is true- I am nineteen years old, I do indeed write, and I am living in Turkey. Here, in Istanbul with a population of 14 million, there are many people. People, like me, with bodies, faces, thoughts, dreams, desires- there are real bodies with real faces. I may be young now, but I am not afraid to look. Looking or not, I do feel both faceless responsibility and faceless grief- or don’t I? Perhaps it is also true- He was a bony, dead, rugged, and was aged to be of about twenty years. He lay in the middle of the street with trash and debris. I could see his jaw in his throat. One eye was was abnormally wide- forced open. The other eye was a gashed, bleeding hole, marking the strike of the blow. He wasn’t a dog. I feel as if a story can make certain unidentifiable, uncomprehendable ideas present. I can look at things I never looked at; I can make you believe. I can paint faces and apply them to these emotions- to grief, love and pity. I can face the suppressed and the faceless. I can make myself feel again. This entry was posted in Short Story and tagged ambiguity, bravery, death, Diren Gezi, Diren Istanbul, Diren Kadıcöy, Diren Türkiye, fact, fiction, Gezi Park, grief, Istanbul, Kadıköy, Occupy Gezi, Türkiye, tear gas, truth, truths, Turkey, writing. Barış and Cenk grew up in the pleasant Turkish village of Çine. Best friends with a bond since birth, they wrestled together, played together, learned together and matured together. Growing up from the same woven cloth, they seemed inseparable. As they reached the end of their adolescence, they would meander down different paths. Both chose Istanbul to serve as their planform to transition into adulthood, but would fade from each other’s view in a city of fourteen million. Barış would further his education by studying mechanical engineering at Doğuş Üniversitesi in Kadıcöy. His former best friend and classmate would attend the Gümüşdere Köyü Polis Akademisi (National Police Academy at Gümüşdere) to join the Çevik Kuvvet (Rapid Response Force aka “riot squad”) section of the Emniyet Genel Müdürlüğü (National Turkish Police). 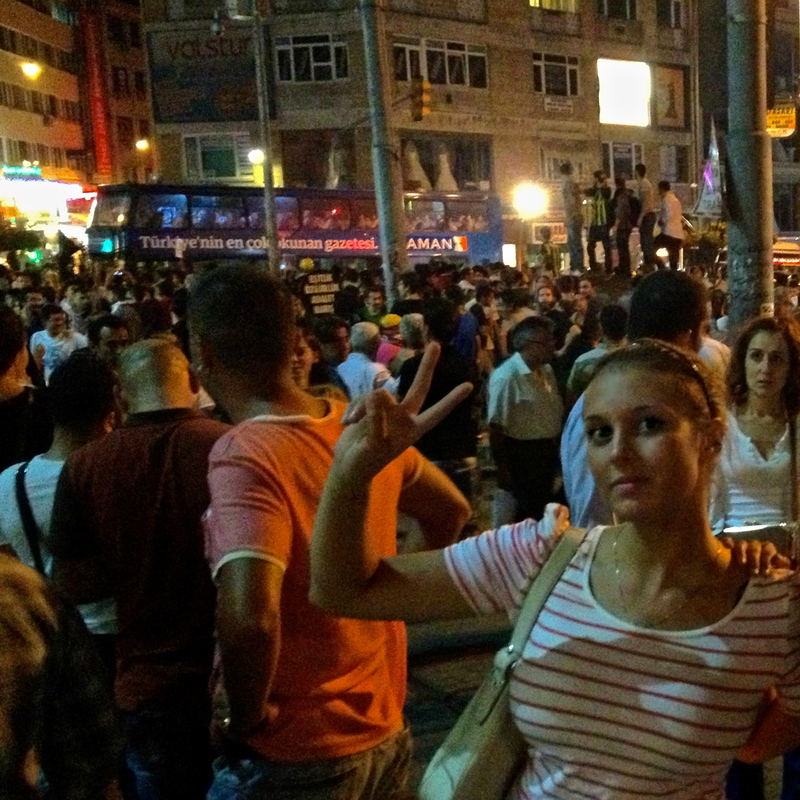 One clear night in early September, when the Çevik Kuvvet were out on patrol monitoring the Diren Kadıcöy protest near the Kadicöy Boğa Heykeli, Barış and Cenk got into a fist fight. It was about something stupid, Cenk found Barış near a freshly painted stain of graffiti that read “Katil Polis” (murder the police) to which he assumed a betrayal but this surmise was not justified. Even so, the fight was nefarious. For a while, it went back and forth. The crowd continued to riot viciously and circled around the two, creating a ring for the match. Cenk was much bigger and much stronger now. He eventually wrapped his right arm around Barış’s neck and pinned him down. He kept hitting him, callously, on the nose. He hit him so hard, with such ferocity and intensity. He didn’t stop; he couldn’t. Through the clamors of terror continuing around them, Barış’s nose made an audible, sharp snapping sound like a firecracker. Blood shot out from Barış’s face and stained the scene and, even then, Cenk kept hitting him over and over with quick, stiff, accurate blows. It took three men to pull him off. When it was over, Barış had to be carried to the rear of the demonstration to be transported out for medical attention. He was admitted to Acıbadem Kadıcöy Hastenesi where he had his nose looked after. Two days later, he rejoined his fellow demonstrators wearing a metal splint and lots of besmirched gauze. In any other circumstance it might have ended there, but this was Turkey- where men were proud and chased after action for justice; where revenge was necessary in terms of honour; where men carried guns. Cenk started to worry. It was mostly in his head. There were no threats made against him nor were there any vows of retaliation. There was only a silent tension between them that made Cenk take special precautions out of impenetrable paranoia. On patrol in Kadıcöy, he was very careful to keep track of Barış’s whereabouts. He volunteered to man the TOMA water cannon and drove it on the far side of the perimeter; when on foot, he kept his back covered and his fingers fused to the trigger; he avoided all situations that might put the two in contact at all costs. Eventually, after a week of this, the strain began to create problems. Cenk could not relax. This tension disoriented him profoundly. He felt like he was fighting two different battles. There was no safe ground for him. He had enemies everywhere, even among his trusted friends and fellow comrades. The battlefield was warped, almost fantastical and extremely difficult to maneuver and hide for it contained mirrors too. The effects hit Cenk hard. At night, he had serious trouble sleeping. He had a skittish feeling where he was always on guard; he heard strange noises in the dark; he imagined the tickle of a knife against his ear. The distinction between good guys and bad guys had disappeared for him. Even in times of relative safety, when his unit waited for action by the waterfront and passed the time by gossiping and laughing as boys do, Cenk would be sitting with his back against a stone wall with his weapon across his knees watching Barış with quick, nervous eyes. It got to the point where he lost control. Something clearly snapped inside him. One action-less afternoon by the Bosphorus, he began firing his weapon in the air screaming Barış’s name. Cenk, just firing and yelling, interrupting innocent commuters as they feared to board the ferry home. He did not stop until he had rattled off an entire magazine of ammunition. Everyone, officers and civilians alike, dropped and pinned themselves flat on the ground. No one had the nerve to go near him. Cenk started to reload, but then suddenly stopped, expressionless, and collapsed to the ground. He held his head in his arms, AK in his lap, and sat, frozen. For two or three hours, he just sat there, paralysed. This was not the bizarre part. Later, that same night, when he was exempt from duty, he grabbed an heirloomed flintlock pistol. He unconventionally gripped it by the barrel and used it savagely, like a hammer, to break his own nose. everything was square between them. Barış nodded and mouthed “evet” under his breath to signify sure, things were square between them. In the morning Barış could not stop laughing. “Bu adam deli,” (that man is crazy) he said. “Grafiti yazdım” (I wrote the graffiti). This entry was posted in Short Story and tagged Barış, brothers, conflict, Düşmanlar, demonstration, Diren Kadıcöy, enemies, fiction, friends, Istanbul, Occupy Turkey, Short story, Turkey, writing, Young Turks.